Baluchistan, Pakistan - long target of Western geopolitical interests, terror wave coincides with Gwadar Port handover to China. February 18, 2013 (LD) - Quetta, the capital of Pakistan's southwest Baluchistan province, bordering both US-occupied Afghanistan as well as Iran, was the site of a grisly market bombing that has killed over 80 people. 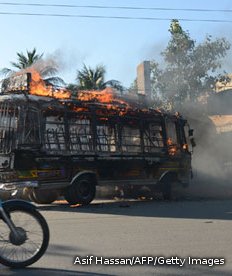 According to reports, the terrorist group Lashkar-e-Jhangvi has claimed responsibility for the attack. Billed as a "Sunni extremist group," it instead fits the pattern of global terrorism sponsored by the US, Israel, and their Arab partners Saudi Arabia and Qatar. The terrorist Lashkar-e-Jhangvi group was in fact created, according to the BBC, to counter Iran's Islamic Revolution in the 1980's, and is still active today. Considering the openly admitted US-Israeli-Saudi plot to use Al Qaeda and other terrorist groups across the Middle East to counter Iran's influence, it begs the question whether these same interests are funding terrorism in Pakistan to not only counter Iranian-sympathetic Pakistani communities, but to undermine and destabilize Pakistan itself. Since Saudi-Qatari geopolitical interests are entwined with Anglo-American interests, both the "investment" and "return on this investment" are clearly part of a joint venture. France's involvement in Mali has demonstrably failed to curb such extremists, has instead, predictably left the nation occupied by Western interests while driving terrorists further north into the real target, Algeria. Additionally, it should be noted, that France in particular, played a leading role along side Qatar and Saudi Arabia in handing Libya over to these very same extremists. French politicians were in Benghazi shaking hands with militants they would be "fighting" in the near future in northern Mali. Saudi Arabia is the world's largest source of funds for Islamist militant groups such as the Afghan Taliban and Lashkar-e-Taiba – but the Saudi government is reluctant to stem the flow of money, according to Hillary Clinton. "More needs to be done since Saudi Arabia remains a critical financial support base for al-Qaida, the Taliban, LeT and other terrorist groups," says a secret December 2009 paper signed by the US secretary of state. Her memo urged US diplomats to redouble their efforts to stop Gulf money reaching extremists in Pakistan and Afghanistan. "Donors in Saudi Arabia constitute the most significant source of funding to Sunni terrorist groups worldwide," she said. Lashkar-e-Jhangvi has also been financially linked to the Persian Gulf monarchies. Stanford University's "Mapping Militant Organizations: Lashkar-e-Jhangvi," states under "External Influences:"
LeJ has received money from several Persian Gulf countries including Saudi Arabia and the United Arab Emirates These countries funded LeJ and other Sunni militant groups primarily to counter the rising influence of Iran's revolutionary Shiism. 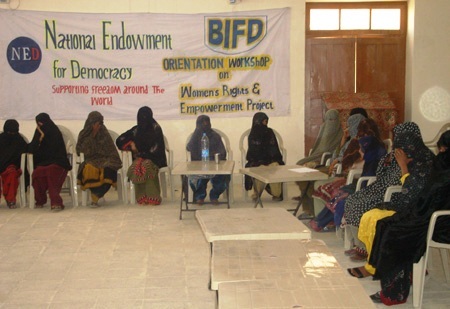 The US State Department's National Endowment for Democracy (NED) has been directly funding and supporting the work of the "Balochistan Institute for Development" (BIFD) which claims to be "the leading resource on democracy, development and human rights in Balochistan, Pakistan." In addition to organizing the annual NED-BFID "Workshop on Media, Democracy & Human Rights" BFID reports that USAID had provided funding for a "media-center" for the Baluchistan Assembly to "provide better facilities to reporters who cover the proceedings of the Balochistan Assembly." We must assume BFID meant reporters "trained" at NED-BFID workshops. Images: In addition to the annual Fortune 500-funded “Balochistan International Conference,” the US State Department's National Endowment for Democracy has been busy at work building up Baluchistan's "civil society" network. This includes support for the "Balochistan Institute For Development," which maintains a "BIFD Leadership Academy," claiming to "mobilize, train and encourage youth to play its effective role in promotion of democracy development and rule of law." The goal is to subvert Pakistani governance while simultaneously creating a homogeneous "civil society" that interlocks with the West's "international institutions." This is how modern empire perpetuates itself. There is also Voice of Balochistan whose every top-story is US-funded propaganda drawn from foundation-funded Reporters Without Borders, Soros-funded Human Rights Watch, and even a direct message from the US State Department itself. Like other US State Department funded propaganda outfits around the world - such as Thailand's Prachatai - funding is generally obfuscated in order to maintain "credibility" even when the front's constant torrent of obvious propaganda more than exposes them. Image: Far from parody, this is the header taken from the "Baloch Society of North America" website. Perhaps the most absurd operations being run to undermine Pakistan through the "Free Baluchistan" movement are the US and London-based organizations. The "Baloch Society of North America" almost appears to be a parody at first, but nonetheless serves as a useful aggregate and bellwether regarding US meddling in Pakistan's Baluchistan province. The group's founder, Dr. Wahid. Baloch, openly admits he has met with US politicians in regards to Baluchistan independence. This includes Neo-Con warmonger, PNAC signatory, corporate-lobbyist, and National Endowment for Democracy director Zalmay Khalilzad. Dr. Wahid Baloch considers Baluchistan province "occupied" by both the Iranian and Pakistani governments - he and his movement's humanitarian hand-wringing gives Washington the perfect pretext to create an armed conflagration against either Iran or Pakistan, or both, as planned in detail by various US policy think-tanks. 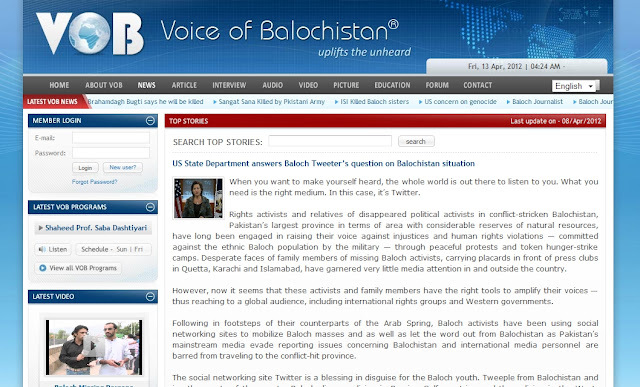 There is also the Baloch Students Organisation-Azad, or BSO. While it maintains a presence in Pakistan, it has coordinators based in London. London-based BSO members include "information secretaries" that propagate their message via social media, just as US and British-funded youth organizations did during the West's operations against other targeted nations during the US-engineered "Arab Spring." 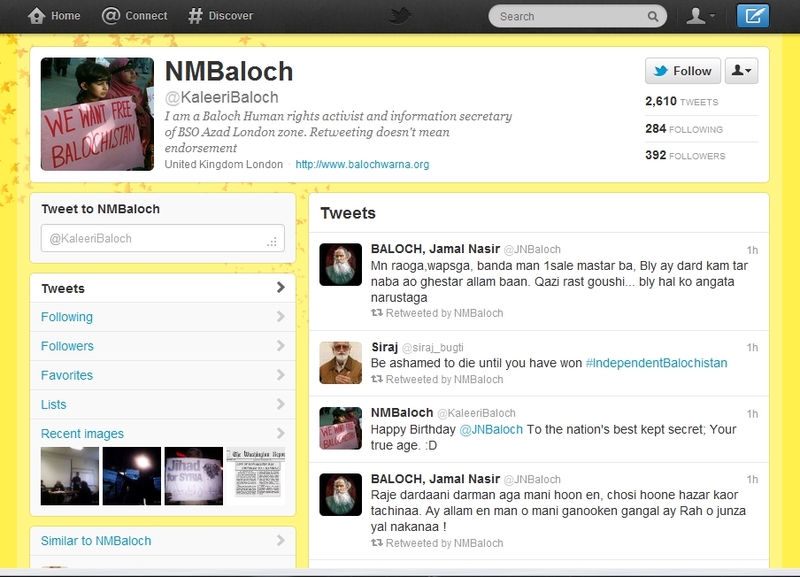 Image: A screenshot of a "Baloch Human rights activist and information secretary of BSO Azad London zone" Twitter account. This user, in tandem with look-alike accounts has been propagating anti-Pakistani, pro-"Free Baluchistan" propaganda incessantly. They also engage in coordinated attacks with prepared rhetoric against anyone revealing US ties to Baluchistan terrorist organizations. Image: Why Baluchistan? Gwadar in the southwest serves as a Chinese port and the starting point for a logistical corridor through Pakistan and into Chinese territory. The Iranian-Pakistani-Indian pipeline would enter from the west, cross through Baluchistan intersecting China's proposed logistical route to the northern border, and continue on to India. Destabilizing Baluchistan would effectively derail the geopolitical aspirations of four nations. 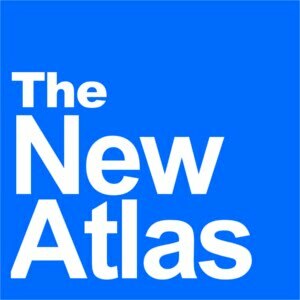 Selig Harrison of the convicted criminal, George Soros-funded Center for International Policy, has published two pieces regarding the armed “liberation” of Baluchistan. While aspirations of freedom and independence are used to sell Western meddling in Pakistan, the geopolitical interests couched behind this rhetoric is openly admitted to. The prophetic words of Harrison should ring loud in one's ears today. It is in fact this month, that Pakistan officially hands over the port in Gwadar to China, and Harrison's armed militants are creating bloodshed and chaos, attempting to trigger a destructive sectarian war that will indeed threaten to "oust the Chinese from their budding naval base at Gwadar."